Public biomedical data repositories often provide web-based interfaces to collect experimental metadata. However, these interfaces typically reflect the ad hoc metadata specification practices of the associated repositories, leading to a lack of standardization in the collected metadata. This lack of standardization limits the ability of the source datasets to be broadly discovered, reused, and integrated with other datasets. To increase reuse, discoverability, and reproducibility of the described experiments, datasets should be appropriately annotated by using agreed-upon terms, ideally from ontologies or other controlled term sources. This work presents “CEDAR OnDemand”, a browser extension powered by the NCBO (National Center for Biomedical Ontology) BioPortal that enables users to seamlessly enter ontology-based metadata through existing web forms native to individual repositories. CEDAR OnDemand analyzes the web page contents to identify the text input fields and associate them with relevant ontologies which are recommended automatically based upon input fields’ labels (using the NCBO ontology recommender) and a pre-defined list of ontologies. These field-specific ontologies are used for controlling metadata entry. CEDAR OnDemand works for any web form designed in the HTML format. We demonstrate how CEDAR OnDemand works through the NCBI (National Center for Biotechnology Information) BioSample web-based metadata entry. Biomedical data are increasingly being deposited in public repositories accompanied by descriptive metadata. These metadata are crucial for facilitating the discovery of the associated datasets and for reproducing the corresponding experiments. Many public data repositories provide web-based forms for researchers to enter metadata describing their datasets as part of the submission process. However, most repositories make limited use of controlled vocabularies in the metadata entry process and, as a result, metadata are often described using inconsistent terminologies . This lack of standardization makes it difficult to access, find, interoperate, and reuse the datasets, and—crucially—to understand how the associated experiments were performed. Improvements are needed to make these datasets more FAIR (Findable, Accessible, Interoperable, and Reusable) . The use of terms from controlled terminologies and ontologies can provide an important first step for creating FAIR metadata descriptions . A wide array of ontology-based services have been developed in order to promote scientific data interoperability and reusability in biomedicine through the use of standard terminologies. These include BioPortal , the Ontology Lookup Service (OLS) , EBI Zooma , and NCBO Annotator and Recommender [7, 8]. In addition, data (metadata) standardization efforts have been established by different communities to ensure sufficient amount of information (metadata) be provided for reporting results in a way that facilitates reproducibility such as MIAIME (Minimum Information for Reporting Microarray Experiment) , MiAIRR (Minimal Information about Adaptive Immune Receptor Repertoire) [10, 11] and MIBBI (Minimum Information for Biological and Biomedical Investigations) . The Center for Expanded Data Annotation and Retrieval (CEDAR)  has leveraged existing data standards and the ontologies available at BioPortal to develop the CEDAR Workbench with the goal of creating semantically rich metadata. A user either can create a new template (web form) or can use existing ontology-controlled templates to author standardized metadata within CEDAR Workbench. An example employing CEDAR Workbench for customized data submission is . Expanding CEDAR’s approach of metadata creation outside of its environment, we have incorporated BioPortal ontologies and web services to develop a decentralized metadata authoring tool called “CEDAR OnDemand”. CEDAR OnDemand is a platform-independent program running as a web browser extension designed to help creating standardized metadata in repository-native web forms. The key advantage of this approach is that it enables users to seamlessly enter ontology-based metadata into existing web forms without requiring the individual repositories to provide these services. The CEDAR OnDemand script has been developed as a Google chrome browser extension  (a browser extension is essentially a small software program that can access contents of a web page, modify it and can enhance the functionality of a web browser). It is powered by the NCBO Annotator  and Recommender  Web services and facilitates users to suggest entry-time ontology controlled metadata to fill up web forms. After installation, the extension will appear as an icon on the chrome extension bar (upper right side of the browser). It is designed to be manually toggled on upon entry of a web form (it can be toggled off later if needed). Although CEDAR OnDemand can be programmed to be auto-activated, we used the manual activation method to minimize the system memory usage and to protect users from browser-based security attacks . The extension operates in three phases (described below) that are initiated when a user visits a new web-based (metadata) entry form. To detect data entry fields, the web page is analyzed to identify text input fields and the associated field labels (Fig. 1, left side). CEDAR OnDemand parses the content of a web page into the document object model (DOM) , which defines the content, structure and style of an HTML document (Fig. 1, left panel treeview). The current implementation of CEDAR OnDemand recognizes the standard INPUT fields (HTML5 and previous versions) and their associated labels (HTML5 element). The recognized fields are highlighted with light yellow color. The metadata entry of the detected input fields will be controlled by the list of ontologies chosen by the qualified ontologies. The CEDAR OnDemand ontology recommendation algorithm is designed to recommend ontologies relevant to each input field listed in a webform from the BioPortal  ontologies. CEDAR OnDemand takes each field label as input (as shown in Label 2 in Fig. 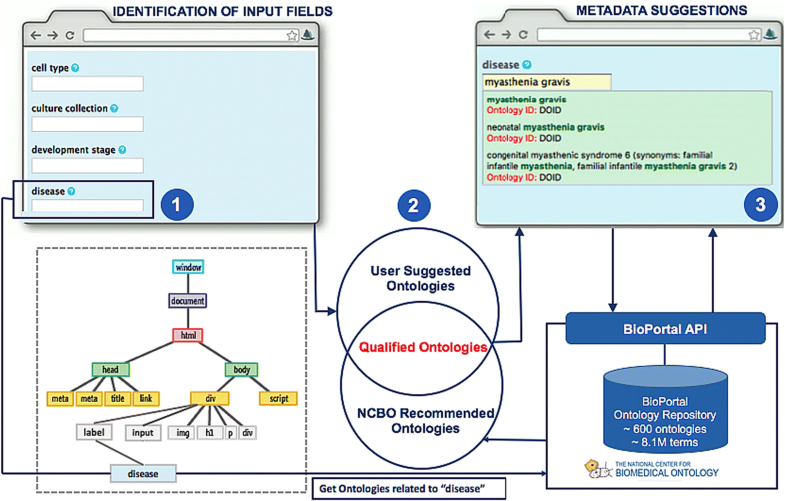 1) to the NCBO Recommender 2.0 service  to get a list of BioPortal ontologies (containing terms matching the field label). Moreover, a user can also define ontologies through a dialogue box which appears by toggling the CEDAR OnDemand extension. The CEDAR OnDemand algorithm takes the intersection of the set of user-defined ontologies and that of ontologies recommended automatically (by the NCBO recommender) to produce the set of qualified ontologies for each field. These field-specific qualified ontologies are then linked to each input field in a web form. If the intersection is an empty set, then the full user-defined list is used for as the qualified ontologies for controlling the field entry. By default, the user-defined list includes six ontologies: ChEBI Ontology , Human Disease Ontology (DOID) , Gene Ontology (GO) , Ontology for Biomedical Investigations (OBI) , Phenotypic Quality Ontology , Protein Ontology (PR)  (Fig. 1, Label 2). Not only do these ontologies cover a broad range of biological domains, but they are also ranked among the top ten by OBO Foundry in terms of their compliance to ontology best practice . The user may change the default ontology list by adding/removing ontologies anytime during the metadata entry process. In its default behavior CEDAR OnDemand works fully automatically and does not require an ontology input from the user. However, customizing the default ontology list may help the user to get domain-specific metadata suggestions. We tested CEDAR OnDemand by entering metadata using the NCBI human BioSample web form1 . In this use case, we first extended the user defined ontology list by adding several field-specific ontologies identified through NCBO recommender: Cell ontology (CL) , Cell Line Ontology (CLO) , NCI thesaurus NCIT , NCBI Taxonomy ontology NCBITAXON , and Uber Anatomy Ontology (UBERON) . The NCBI human BioSample web form contains twenty-one text input fields. CEDAR OnDemand suggested eight ontologies based on the input fields in the NCBI human BioSample web form. After intersection with the user defined ontologies (extended list), the final ontology list recommended by the CEDAR OnDemand includes: NCI thesaurus NCIT , Cell Ontology , Cell Line Ontology , (UBERON) , Human disease Ontology , Gene Ontology (GO)  and OBI  (See Table 1). Controlled vocabularies do not make sense for some text fields, such as “Sample Name”, “Age” and “isolate”. Therefore, CEDAR OnDemand allows the user to override ontology suggestions for all fields with the user-defined entries. CEDAR OnDemand provides the field's specific metadata suggestion controlled by ontologies. Thus, users are no longer entering free text but they are instead using standardized ontology terms. An auto-completion feature is provided at runtime through a drop-down list. As an example (Fig. 1, Label 3), CEDAR OnDemand suggests “myasthenia gravis” as controlled term (defined in DOID) for the disease field. Although many public repositories, such as those run by the NCBI, provide easy-to-use tools and interfaces for entering and querying metadata, scientists who upload their datasets are generally not constrained to use standard terminologies when they define the necessary metadata. As a result, metadata are often described using inconsistent terminologies, limiting scientists’ ability to access, find, interoperate and reuse the datasets and to understand how the experiments were performed. Scientific data analysis or mining  often requires multiple datasets to be integrated within a single repository or across multiple repositories. Such integration would be easier if the datasets and their metadata were identified globally, described using standardized terminologies, and available in a standardized machine readable format. A common semantic schema  among different studies and data sources can be achieved by associating relevant ontology classes with each study's metadata. Despite the free availability of ontology resources [26, 36], only few repositories (e.g., IEDB -The immune epitope database ) and frameworks (e.g., SEBI-Semantic enrichment of biomedical Images [38, 39]) have integrated ontologies or structured controlled lists within their framework to collect standardized metadata. PubMed uses Medical Subject Headings  as a controlled vocabulary for indexing and searching biomedical literature. Meshable  highlights an important issue in PubMed literature searching. In PubMed, biologists can use MeSH terms as queries to get the precise results. However, these are rarely used, and there is no convenient way to author standardized MeSH terms as queries. Through CEDAR OnDemand, users can suggest MeSH Ontology  replacing the default user-defined list and can get entry-time query suggestions from the MeSH controlled vocabulary. CEDAR OnDemand has the potential to improve the FAIRness and overall quality of metadata to the available repositories. However, the current infrastructure has some limitations. For instance, the diversity in the input field coding schemes (e.g., <div, <inputfield and < text) limits the HTML tags detection script when there are custom-build tags are used to define the input fields. Our script identifies the standard HTML5 tags, Label was introduced in HTML5. However, input tag was present at the very beginning (i.e., <input type = “text”) to represent an input field. Though CEDAR OnDemand works with web forms designed in HTML4 or with older versions, the ontology recommendation algorithm does not make use of the field associated (labels) information for ontology recommendation in these cases, relying instead on the users suggested ontology list. A key component of CEDAR OnDemand is the ability to analyze context and suggest appropriate ontologies for each particular field. The current qualified ontology selection process relies on NCBO ontology recommender service  and the user’s suggested ontology list. We have proposed this scheme as the NCBO recommended ontology list can be very long, and may not always recommend ontologies that are specific to a user’s particular domain. Allowing users to customize a set of suggested ontologies helps to address both these issues. Ideally, using the field context along with NCBO recommender would be able to identify and rank all of the relevant ontologies. In practice, it can be difficult to get sufficient context just from the web page and text surrounding a field. Even if enough context is present, it may be technically difficult to extract. For example, the web interfaces for some repositories have been designed using older versions of HTML and some with custom HTML tags. CEDAR OnDemand is a chrome browser extension that enables users to seamlessly enter ontology-controlled metadata using existing web-based submission forms provided by metadata repositories. The use of controlled vocabularies for entering metadata can help improve the quality of metadata submitted to repositories and ultimately contributes to the creation of FAIR data. Operating system(s): Operating system independent works within web browser. We acknowledge the BioPortal and CEDAR team for their valuable suggestions during this research work. This work was supported by grant U54 AI117925 awarded by the National Institute of Allergy and Infectious Diseases through funds provided by the trans-NIH Big Data to Knowledge (BD2K) initiative (https://commonfund.nih.gov/bd2k). Study conception and design: SACB, KHC, SHK, JB, MAM. Code Implementation: SACB. Validated and interpreted the results: SACB, JB, MOC, DB, ALE. Drafting of manuscript: SACB, SHK, KHC. Critical revision: SACB, MMR. All authors read and approved the final manuscript. ZOOMA text annotations tool. http://www.ebi.ac.uk/spot/zooma/. Jonquet C, Shah NH, Youn CH, Callendar C, Storey M-A, Musen MA. NCBO annotator: semantic annotation of biomedical data. International Semantic Web Conference, Poster and Demo session. 2009. https://pdfs.semanticscholar.org/9956/898d4012bb87374931085a643eb06b18ac9f.pdf. Bukhari SAC, O'Connor MJ, Graybeal J, Musen MA, Cheung K-H, Kleinstein SH. Leveraging the CEDAR Workbench for Ontology-linked Submission of Adaptive Immune Receptor Repertoire Data to the Sequence Read Archive (SRA). https://doi.org/10.6084/m9.figshare.4244126.v3. Mehta P. Introduction to Google Chrome Extensions. In: Creating Google Chrome Extensions: Apress. New Delhi: Spinger; 2016. p. 1–33. https://link.springer.com/content/pdf/10.1007/978-1-4842-1775-7.pdf. Kamath C. Scientific data mining: a practical perspective. SIAM; 2009. https://epubs.siam.org/doi/book/10.1137/1.9780898717693.